!! Further information: 8 steps to create interior spaces in twinmotion!! More Information under the video! My name is Mohammad Mahdi Molaee. I graduated from the Architecture Department at the Islamic Azad University of Najafabad and I work as a visualization professor, teaching Twinmotion at the Arc Pro School in Isfahan. 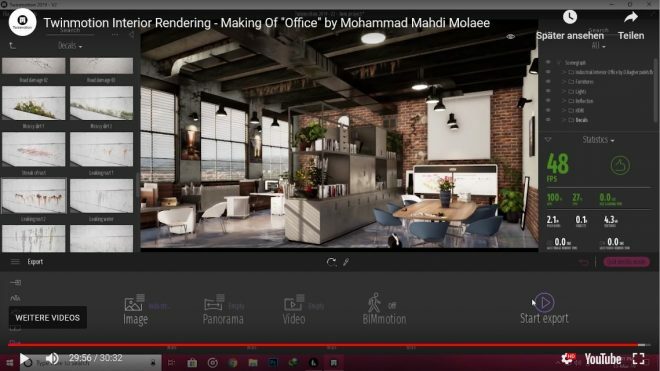 The 3D Model of this scene was designed by Danial Bagherzadeh in Autodesk Revit 2019. I exported the scene to .fbx format using the Revit add-in to Twinmotion 2019. This add-in enables you to either synchronize a Revit model with Twinmotion or export a Revit project to the .fbx format for Twinmotion. In addition, it offers different options to optimize your 3D model for better performance in Twinmotion. Apart from detailed elements with textures already added in Revit, such as the beams and columns, the overwhelming majority of materials are PBR materials from the Twinmotion 2019 library. I created the brick material inside Twinmotion with a Diffuse map and a Normal map. To render this interior scene, I decided to shine light into the environment in order to have light beams on the floor. To do so, I put the sun in front of the windows and increased sun brightness. One tip to improve shadows for an interior project is to set the shadow distance to 50. The smaller the shadow distance is, the sharper the shadow will be.